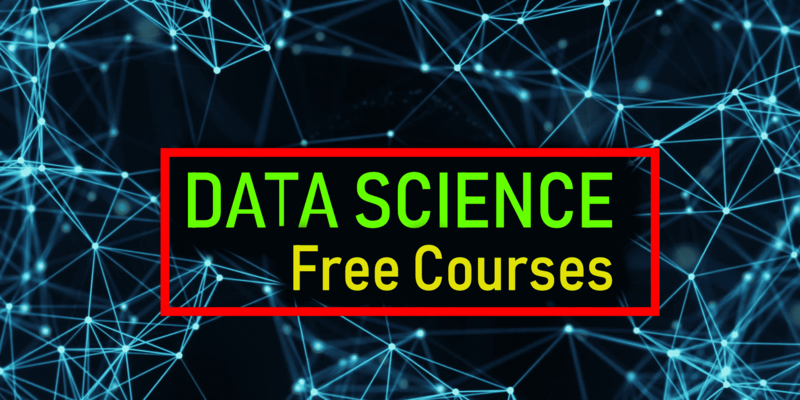 Are you looking for Free online Data Science courses? Yes, it is possible. Data science plays a very crucial role when it comes to companies growth. Why? because with the help of Data Scientist, a company can know more about the behavior of its users or potential clients (For example – Amazon and Flipkart). The understanding of this behavior is very crucial. As it allows them to make required changes in order to increase their profit margins. So this drastically increased the demand of Data scientists in the world. As a result, we are providing with the list of 6 Best free online Data Science courses or free data science courses in 2018 which you need to check out if you want to become a successful data scientist. This course contains all the necessary material to be learned by the beginners. The quality of the course can be clearly verified by the fact that it is introduced by the Massachusetts Institute of Technology (MIT). It covers all the concepts from scratch related to statistics and machine learning. Making it as the best course for undergraduates of computer science department. The course has a strong emphasis on the Python programming and Goto Language for data science implementations. So if you are just a beginner and have a keen interest in becoming a data scientist then you must opt. for this course. Edx being among the top online learning platforms in the world is providing an online data science course. This course is being offered by Microsoft. While learning this course, the students are expected to have an introductory knowledge of programming languages like R and Python. Both the languages are the most powerful and popular pillar of data science. The subjects covered in this course are visualization, data exploration, probability, statistics, and machine learning. The machine learning is taught by using an Azure framework. The course is absolutely free though but students can pay $90 for the official certification of completion. This course beautifully covers a wide range of basic data science topics. Such as statistics, mathematics, machine learning, programming, and data visualization. It’s a very straightforward course introduced by Clare Corthell. Successfully followed tens of thousands of beginners. The simplicity is the core feature of this course. Many students became a pro data scientist after learning it from here. We strongly recommend you this course as it tells you about why the solid foundation of data science through open-source tools is essential/important to bridge the talent gap in the industry. Yes, you read it right. IBM itself is offering a free data science course through its online portal which was formerly known as Big Data University and now called as Cognitive Class. The course includes programming in R, data science 101, hands-on applications and open source tools. Its an absolutely free of cost course. You need not to pay any single penny. Time taken to complete this course may vary. But if you have some prior experience of computer science then it will take you about 20 hrs collectively or less. Whereas talking about beginners it may take some time for them. The terms CS stands for computer science. And the course CS109 is a pure data science oriented course by the worlds most leading university “Harvard University”. The best part about this course is that it has all the required material for the beginners. The content is available in the form of lecture videos. Strong emphasis is given on the gaining insights from data. The course is made by following top-down approach for understanding critical concepts of data science. Being an independent online training provider, Dataquest is doing an amazing job. It has no affiliated program with any university. The majority of the course material is free, but you can pay for its premium access as well. The premium access includes services like tutored projects. This offers three major paths further such as data analyst, data scientist and data engineer, and with endorsements from Uber, Amazon, and of course Spotify. Also Read – 5 Best Programming Languages for Data Science. So this was all regarding 6 Best free online Data Science courses or free data science courses in 2018. If you find it useful let us know in the comment section below. Would love to hear that.